Workers install a billboard supporting Nicaraguan President Daniel Ortega, Managua, Nicaragua, Dec. 21, 2015 (AP photo by Esteban Felix). In November, Nicaraguans will head to the polls to elect a president, members of the National Assembly and representatives to the Central American Parliament. The elections will be the country’s first since constitutional reforms were passed in 2014. 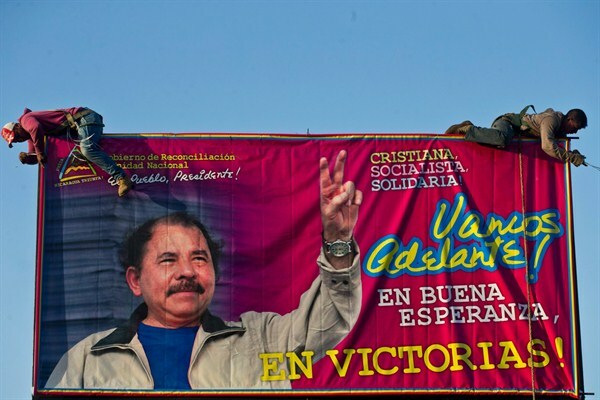 The likely victor of the presidential race, President Daniel Ortega, can now be elected with a simple plurality, although he is predicted to win more than 60 percent of the vote. It would be his fourth term since being elected in 1984 and his seventh presidential campaign overall. Though his candidacy comes as no surprise, two recent controversies—one international and one domestic—have revived debates about Ortega’s stewardship and the status of democracy in Nicaragua.